Talk about a stressful day of driving. 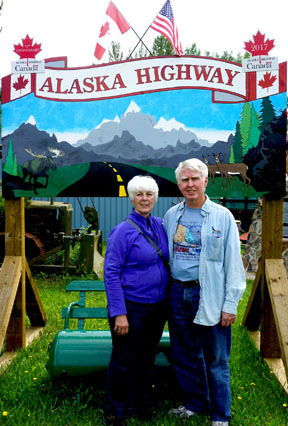 It was a whole 40 miles from Muncho to Liard. Checkout was at 11 a.m. and check-in was supposed to be 1 p.m. so we had all of two hours to make the trip. 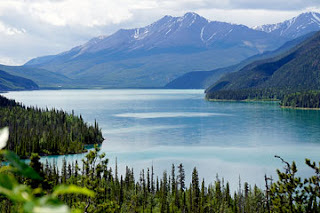 We spent some time at an overlook where we got our last view of lovely Muncho Lake. 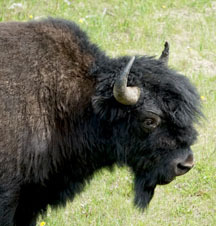 The stone sheep were in hiding today, but there was one lone bison posing at the side of the road. 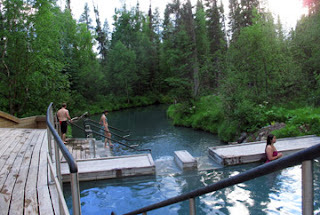 so we got set up and then went to boil ourselves in the hot spring. We learned that the boiling hot water floats on the top so if we stirred the water, the cool water would well up, which made it much more tolerable. We floated until none of us could stand it any more, went back to our rigs and had naps, dinner and then went to bubble again. 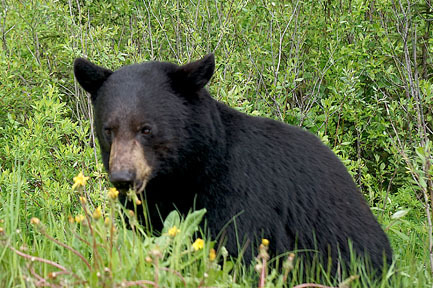 There were signs warning us of wild animals, but they were all in hiding. Today was the day Gerry has waited for since our last road trip up here. We posted our sign in the Watson Lake sign forest. During the construction of the Alaska highway, Watson Lake was one of the construction camps. 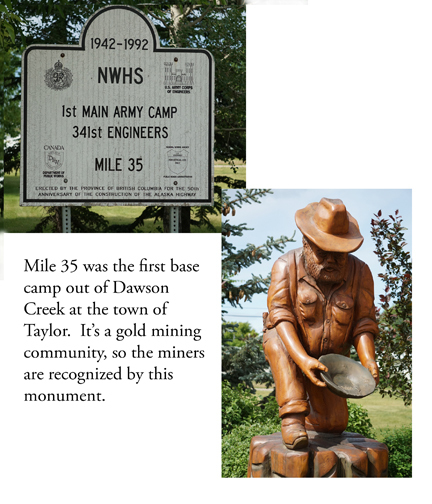 Homesick soldiers posted mile signs to their home towns. 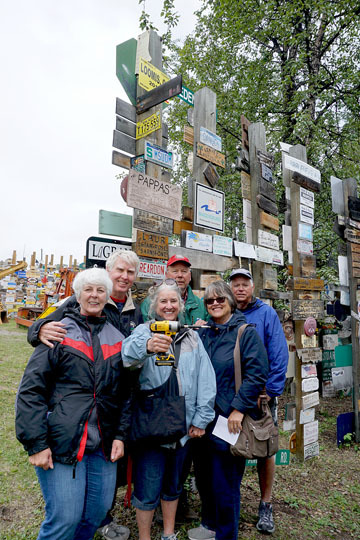 Somehow, as time went on, it became a tradition that people passing through Watson Lake would nail up a sign about their names or home towns. Now there are acres of signs like a maze. 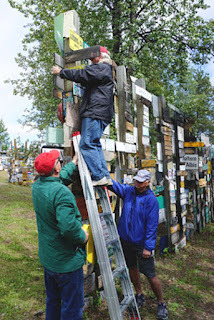 We found a good spot very close to the entrance to the forest and Gerry proudly fastened our sign to the post for all to see for years to come. Gerry wants it known that the sign is near the big green machine, which looks to be a landmark for years to come. We also went to the planetarium show about the northern lights. Beautiful photgraphy, and I am pretty sure it's the only way we'll ever see the lights. Certainly they won't be visible any time during this trip, since even at this latitude it never gets fully dark. It's twilight at 3 in the morning and bright enough to be really annoying by 4:00. 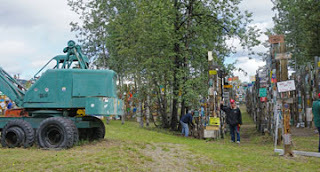 Our night's stop is the Rancheria, the place where we broke down on our last trip up here and had excellent pie while waiting for the tractor-trailer to take the motorhome to Whitehorse. I'm happy to say that the pie is still excellent. It was a beautiful blue sky day for driving. 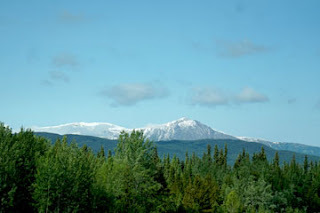 In the distance we could see the spectacular Dawson Mountains, all covered with snow. These are the views we've been looking for! 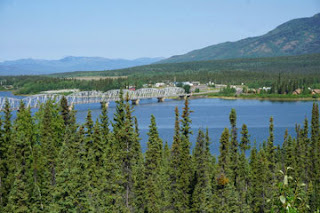 We stopped at the overlook for Teslin to get a photo of the the Nisutlin Bay and the metal bridge crossing it. We got into Whitehorse in the middle of the afternoon. 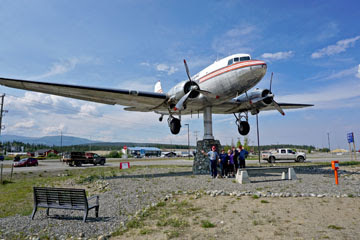 The first touristy spot was the Transportation Museum that covers everything from dog sleds to airplanes, including the DC-3 mounted on a pedestal that is so perfectly balanced that the slightest breeze turns it without a sound. I think it's Gerry's favorite thing of all on this trip. Dinner was at the Ribs and Salmon place in town, which still has the best ever fish and chips and bread pudding. We were going to do all sorts of things today, but then we decided to do non-exciting things like go grocery shopping in the Real Canadian grocery, where we had to be taught how to retrieve a shopping cart. You put a dollar coin, called a loonie, in a slot in the cart to unlock it from the fleet of carts. When you bring it back, you lock it back to the next cart and get your loonie back. Mark found some mechanical things he needed for his trailer, and Dave bugged the glass repair guy until he finally agreed to come out and fix his windshield. So, today is a down day. 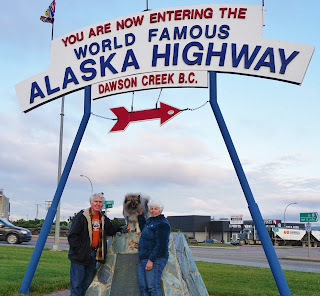 Tomorrow we will do some more sightseeing in Whitehorse before departing from the Alaska Highway to go to Dawson City and the Top of the World highway. Grey and rain again, but it's not supposed to last long. We crossed the crest of the road at Summit, where the view was supposed to be of far mountain ranges, all blue and white with snow. Instead we got fog so thick we were tiptoeing up the road. 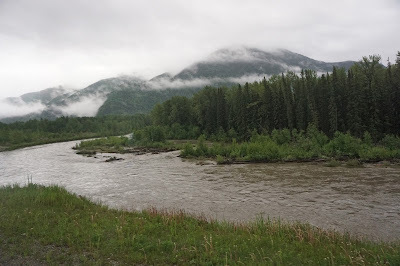 To soothe our feelings for missing out on the scenery, we stopped at the Tetsa River Services and Campground because they advertised themselves as the Cinnamon Bun Center of the Galactic Cluster. Oh, my goodness they were delicious! 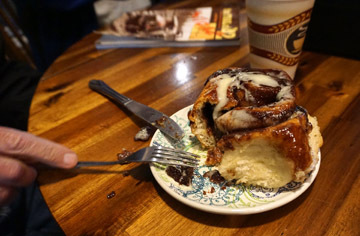 Their cinnamon buns are now the standard against which all other cinnamon buns will be judged. Ooey, gooey, buttery, loaded with cinnamon – yes this is a real cinnamon bun! 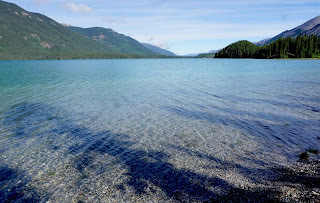 It was early afternoon when we reached Muncho Lake. The camping gods smiled upon us and we got three lovely spots right next to one another. Our windshields look right out on the lake, which is a beautiful, glacial blue-green. We are staying two nights here because Pam and I agreed that one of the few things we regretted about our last trip was that we only spent one night at Muncho. It's a beautiful day today. Blue sky and water like glass. We plan a really stressful day. There was a morning walk down the lake edge to the lodge, where the menu was still overpriced and the staff was rude. Just like we remembered from last trip. Then there was an excursion to find Stone Sheep, which was resoundingly successful since they were entertaining passersby right next to the road. 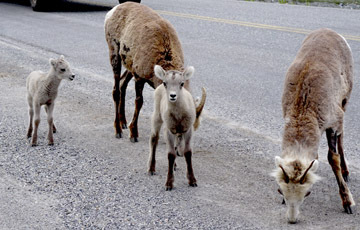 There must be salt or some mineral they like beside the road because they were licking the ground and not paying a whole lot of attention to their adoring audience. 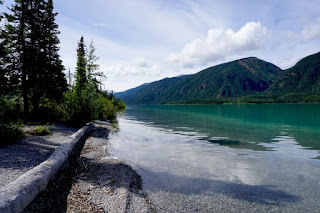 Judy and I painted a memory of Muncho Lake and then the clouds rolled in and the breeze sprang up, so it was time for a mid-afternoon nap to recover from all the wild activities. Gypsy is watching us from her perch in the front window. We knew this was going to be a short day. We got into Ft. Nelson by lunchtime, so we had the pick of the best spots in the little RV park behind the Blue Bell motel. Nothing special – just a flat gravel lot with a row of spaces, but it was level and they had a laundry, so it was good enough. There are lots of flowers around town. 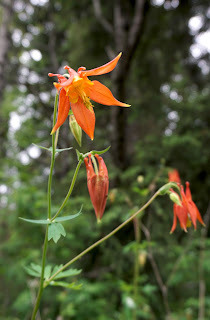 I guess when you have long, dark winters, flowers are good, and you plant them any place that has a spot for them. I am old and fragile. Please treat me with the respect I deserve. Please do not sit in me, play with my buttons or abuse me in any way. 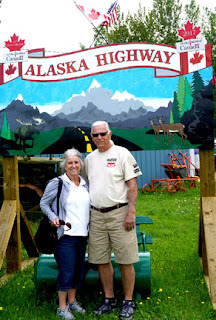 There was another mandatory Alaska Highway sign for a photo op. Otherwise, this was a good stop to do laundry and get a few groceries. The day dawned bright and sunny. At 4:30 AM. I must do something about that skylight over the shower. The light shines right in my eyes and at 4:30 it's highly offensive! 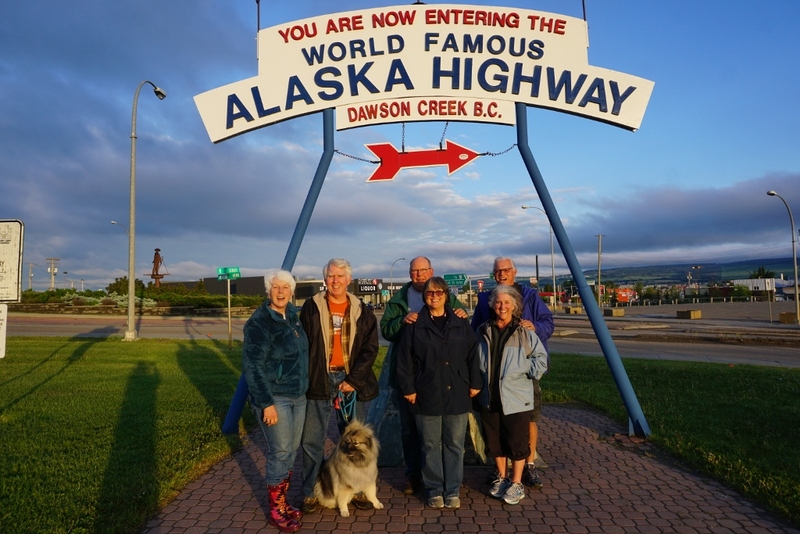 It was a nice day to start our trek on the official Alaska Highway. 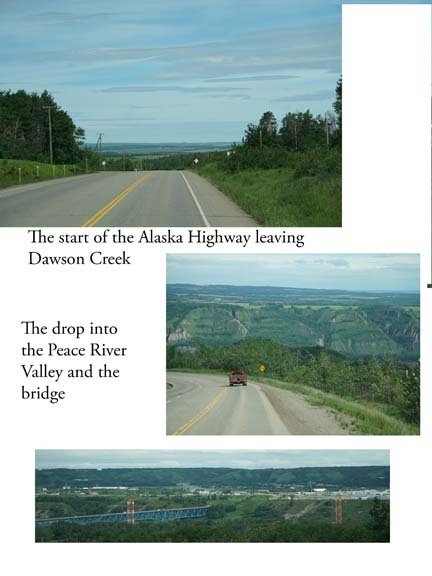 Some of the views were spectacular, especially as we reached the crest of the highway overlooking the Peace River valley. I keep thinking about the soldiers who built this roadway. 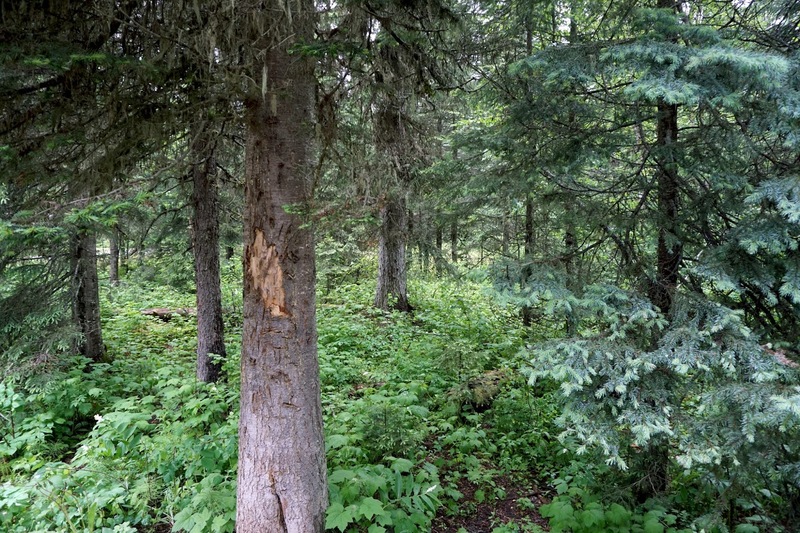 No one had any idea what they were facing, and I'm sure there was some colorful language when they pushed their way through the spruces and mud just to see this enormous dropoff facing them with a wide, rushing river at the bottom of it. The grades down the hill were 8 to l0%! We made a stop at the little town of Taylor to check out the Visitor Center and shake out some of the kinks. There were some pretty good crosswinds to fight, so it was nice to take a rest. The town of Taylor was founded in 1912 by a farmer/trapper and his family. There was anther family near them named Barker. Taylor put up signs announcing the town of Taylor Flat. Barker didn't like this, so when Taylor left on his trapping rounds, Barker would tear down the Taylor Flat signs and put up Barker Flat signs. This feud went on until the Post Office came to town and Taylor gave them a piece of his farm to put up the building, thus winning the fight to name the town. 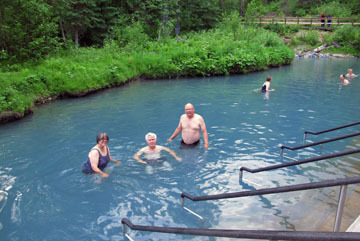 We ended the day at Buckinghorse River Provincial Park, a lovely, quiet park by the small river. The mosquito spray came in very handy! Rain. Rain, rain, rain. 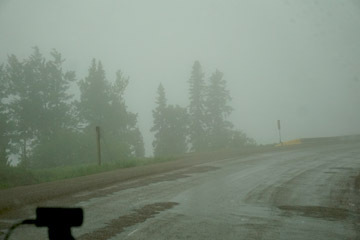 The clouds were so low that sometimes we were driving in them. If we hadn't driven this road before, we would have had no idea that there are spectacular views of the Canadian Rockies to be seen. All we saw was clouds. The road work turned out to be a non-event. As we rolled up to the one lane section, Gerry tried to stop for the flagger but he kept waving us over into the through lane, so we just rolled through like there was nothing there. And on through the rain and clouds we went. The Pine River, which we crossed several times, was high and rushing and fierce. 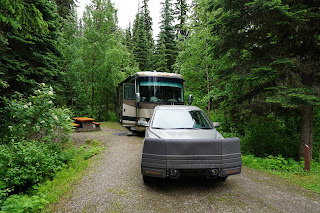 We camped at Mile 0 RV park in Dawson Creek. It was slightly less of a mud hole than the other parks we passed looked like. Since it was still cold and rainy, we toured the Alaska Highway House, a small museum about building the highway. I knew it had to have been hard, but I had no idea how impossible the conditions were. Mud, mosquitoes, permafrost, bitter cold and hot dust – they had it all in a trackless, densely forested wilderness. It was an amazing accomplishment. 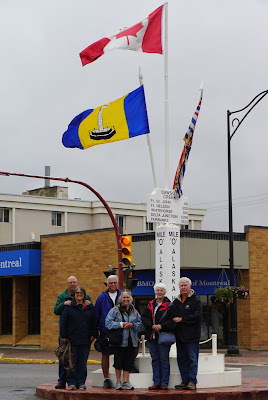 We got the mandatory photos at the original Mile 0 monument even though it was still grey and spitting rain. After dinner the sun made an appearance so we dashed over to the large monument and got photos there. 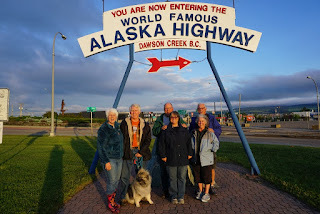 We are off on the official Alaskan Highway on Monday. I suspect we will be out of cell service for a couple of days. has a Saturday farmers' market, so we started our morning there. There wasn't much farming going on this early in the year, but we found wonderful pottery and pie, and did our part to help the local economy. 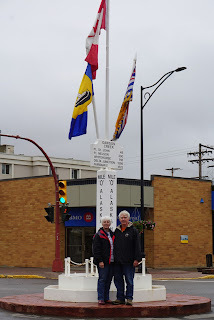 We drove up to Prince George, and after a slightly adventurous detour, found the big Tourist Information office, which wasn't nearly as big and comprehensive as Pam and I remembered from years past. 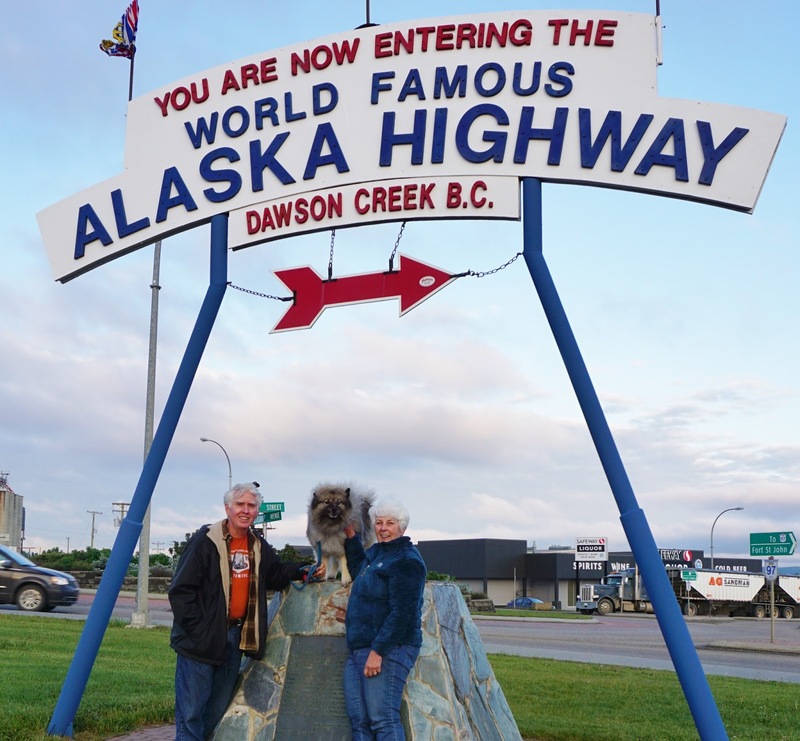 The most worthwhile thing we learned there was that the road to Dawson Creek had a landslide and was closed south of Chetwynd. So we have stopped short of there at Whiskers Point, where we are camping in the deep, dark woods. 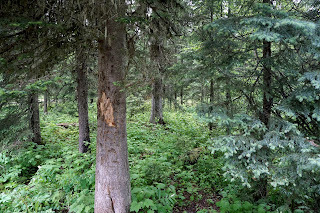 I think there may be trolls or bigfoots (bigfeet?) wandering through the forest. Hopefully the road will be open tomorrow. 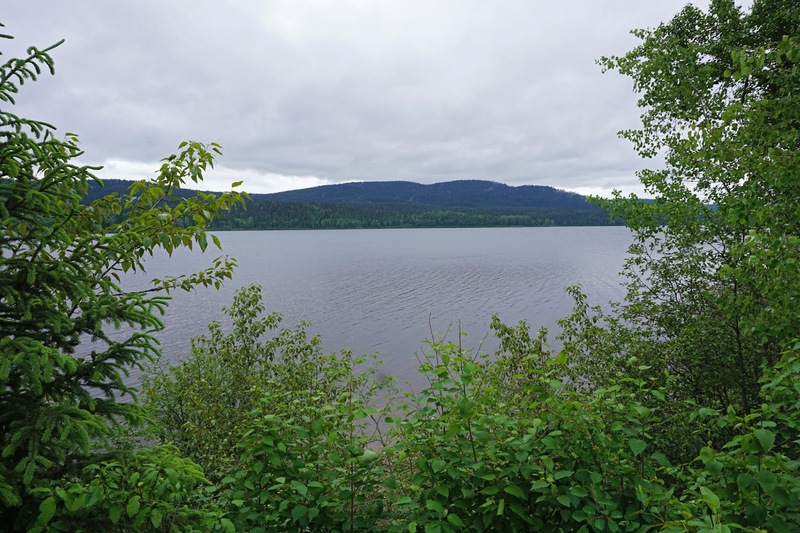 Yesterday we traveled from Lytton, through 100 Mile House to Williams Lake. 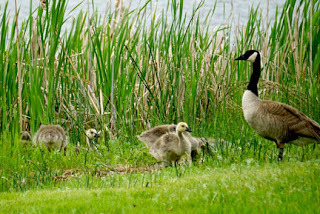 At the100 Mile House stop we enjoyed some bird watching at the nature preserve beside the Tourist Information center. 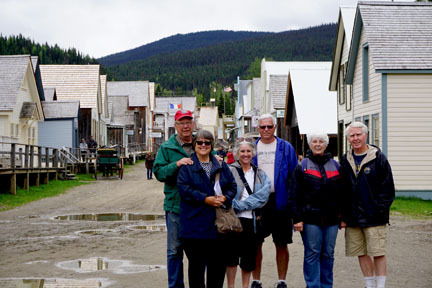 The town got its name during the Cariboo gold rush in the 1860’s. A wagon road carried the gold seekers and all the provisions to the gold fields, with stage stops along the way, cleverly named 50 Mile House, 70 Mile House, 100 Mile House and so forth. We have caught up with Spring as we travel north. 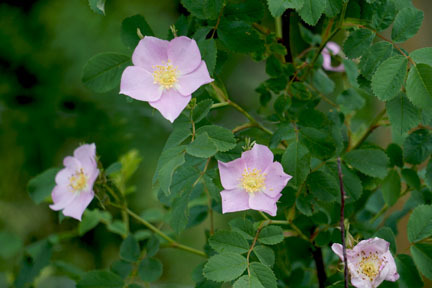 There are lilacs and wild roses blooming all along the highway. 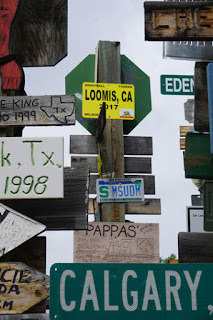 We stayed at the rodeo grounds in Williams Lake. It’s the home of the Williams Lake Stampede and feels very much like any western town that emphasizes the cowboy lifestyle. Today we drove all the way to the town of Queznel (pronounced Kew-nel), all of 74 miles. 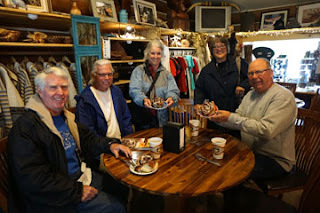 Our first stop was to find Ken, a guy that that Gerry and Dave had met last winter in Yuma while they were all soaking in the hot tub of the RV park. He made the mistake of telling them we should stop in and say “hi” when we came through Quesnel. We took him up on his offer and after a nice visit with him, we left our RVs at his business and drove to the historical park of Barkersville. 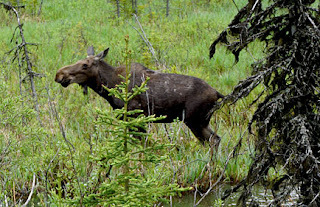 On the way there, we saw our first moose of the trip. She was near the road, wading in a bog and eating water weeds. 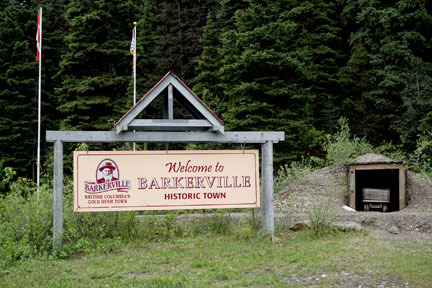 Barkersville was founded during the gold rush of 1862 by a gold miner named Billy Barker. In its heyday, Barkersville was said to be the largest city west of Chicago and north of San Francisco. 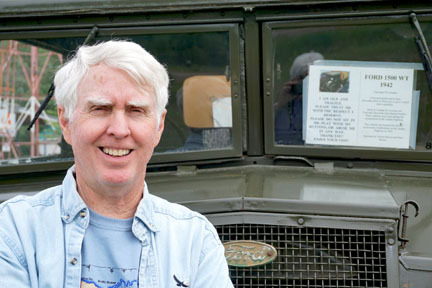 Those glory days lasted until the gold ran out and a fire destroyed most of the town. 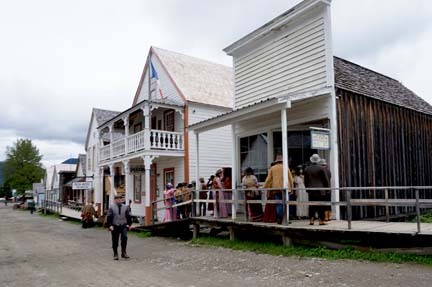 Now it’s a restored Heritage Site with all kinds of displays, shops, and activities, including a cast of characters representing people who lived and worked in Barkersville over the course of years. Here we are, ready to start our adventures in Barkersville. Some of the other visitors on a tour got into the spirit of things and donned period costumes. Tonight we’re staying at the Airport Motel and RV park. There’s an airport? 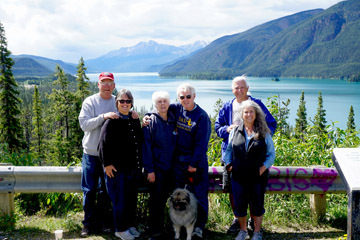 Gerry and I enjoy wandering around the country in our motorhome, Cleo, and accompanied by our traveling companion, Gypsy, and sometimes by our grandkids, Indiana and Micah.